It's shortly after Easter 1985 and I'm with two companions, Graham and Keith, on a long weekend in the Lakes. 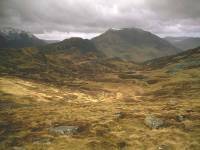 The weather has been fickle and on the Sunday we're making an attempt on Great Gable from Honister after being rained off the previous day. 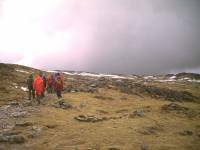 The weather is sombre but the colours are amazing as we cross the Brandreth plateau from the Honister tramway. 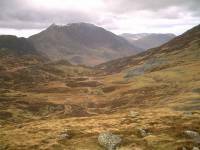 We're looking northwest towrds Haystacks, High Crag and High Stile. This is the head of the river Cocker, which forms Buttermere, Crummock and Loweswater on its way out to the coast. 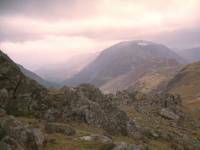 The High Stile range is centre, with Haystacks on the left and the slopes of Fleetwith Pike on the right. 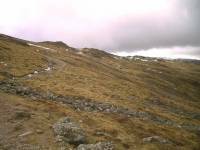 The path rising across the shoulder of Brandreth. We can see some snow ahead. It's not cold, but it is very windy and we can see a storm brewing ahead. This group of walkers all had their wet weather gear on. Within a few minutes, so did we. Here, on the highest point of the path, we can see Buttermere to the right of High Crag and High Stile (which is just in cloud). Haystacks is over to the right, looking like a sugarloaf dome from here. It looks a bit daunting ahead. 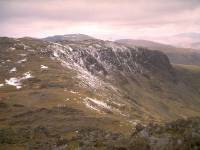 Those are the western slopes of Green Gable, dusted with new snow. 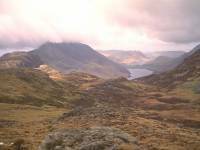 We're looking down into Ennerdale from the path up Green Gable. Pillar lies to the right. A few minutes later we were in cloud, and a vicious wind was lashing rain straight into our faces. After waiting a few minutes we made a collective decision to abort, though Keith dashed up to the summit of Green Gable and back. We turned round and went back the way we came. 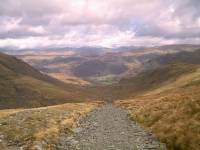 The one shot I took on the return walk looks down into upper Borrowdale from the old slate quarry tramway above Honister Pass. On the skyline is Helvellyn and its neighbours, liberally coated in snow. The weather remained pretty foul right through 1985.